#Apress “Practical Enterprise Data Lake Insights” – Published! Gives me immense pleasure to announce the release of our book “Practical Enterprise Data Lake Insights” with Apress. The book takes an end-to-end solution approach in a data lake environment that includes data capture, processing, security, and availability. Credits to the co-author of the book, Venkata Giri and technical reviewer, Sai Sundar. Thank you for all your confidence, support, and encouragement. Thanks Monica Caldas, CIO (GE Transportation) for helping us with the Foreword column. Each chapter includes application of a concept, code snippets, and use case demonstrations to provide you with a practical approach. You will learn the concept, scope, application, and starting point. Use this practical guide to successfully handle the challenges encountered when designing an enterprise data lake and learn industry best practices to resolve issues. Grab your copies fast. Enjoy reading! 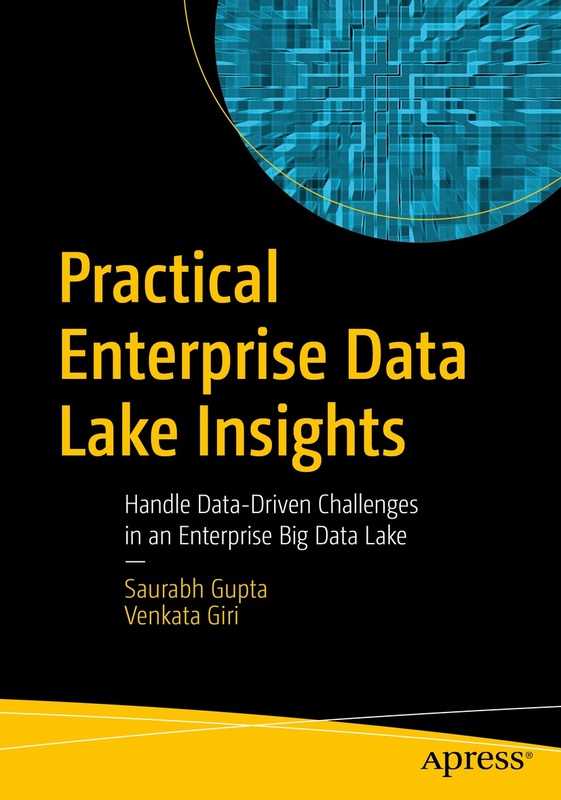 Author Saurabh K. GuptaPosted on June 30, 2018 Categories OracleTags Analytics, Big Data, Data Lake, Database security, flume, Hadoop, hive, kafka, kerberos, pig, presto, spark, sqoop, WandiscoLeave a comment on #Apress “Practical Enterprise Data Lake Insights” – Published! Oracle Engineered Systems are highly efficient integrated systems which combine hardware and software to provide a complete enterprise solution to the customers or partners. The focus of the Oracle Engineered Systems is to give extreme performance, high scalability and maximum availability by reducing infrastructure complexity and setup cost. The pre assembled innovative systems have greatly simplified the requirements of a data center. One of the most complete enterprise systems in the current times, oracle engineered systems have everything to offer and fit the requirement. It can be understood as a box packaged box comprising of application support, operating system, virtualization, hardware management, networking support, and optimized storage scheme; all assembled to offer highly efficient and scalable solution to the customers. Exadata is one of the fastest database machines which work for both OLTP and data warehousing applications. It is a packaged integration of hardware and software comprising of server (Oracle 11g database servers), storage (Exadata Storage server), networking (InfiniBand), and virtualization. The Exadata machines are efficient to store upto 10 times more data and yield 10x-50x times better execution performance. The Exadata machine runs on the latest database version i.e. Oracle 11g Release 2. Currently, there are two versions of Oracle Exadata namely, X2-2 and X2-8. The X2-2 version is a lower version with 2 to 8 twelve core database servers. The X2-8 version is best suited for huge requirements with 2 eighty core database servers. Depending upon the database size and performance requirements, these versions can be deployed in quarter rack, half rack and full rack configuration. Lower configurations can be upgraded to the next level with zero downtime, thus making it a scalable solution. Key features of Exadata which contribute to the extreme performance are smart scan, hybrid columnar compression, smart flash cache, intelligent I/O resource management, smart flash logging, and storage indexes. Oracle encourages its partners and customers (ISV) to have hands on Exadata and Exalogic through Oracle’s Exastack progam. The OPN members can utilize Oracle resources to achieve Oracle Exastack Ready or Oracle Exastack Optimized status. Oracle Exastack ready status qualifies an OPN member to be beneficiary based on their exhibition on Oracle products. A gold partner with Oracle Exastack optimized status has full access to technical resources from oracle and lab environments. Exalogic is the high performance engineered system which is specifically designed for running Oracle Fusion Middleware, Oracle’s Fusion and Java based applications. Besides the enterprise applications, Exalogic works equally well for Linux or Solaris based applications. For Java based application mounted on Exalogic, performance can be improved upto 10x times with 5x more active users. Oracle applications run 4x times faster as compared to the normal servers with 3x times more active users. Key software engineered with the Exalogic hardware are Weblogic server, Coherence, JRockit and Hotspot, Exalogic elastic cloud software, Oracle linux, and enterprise manager for cloud monitoring and control. Exalogic is available in quarter rack, half rack, full rack and even multi racks (2-8) versions. Upgrades are possible from lower configuration to higher one with zero downtime and negligible maintenance issues. An Exalogic unit is configured with cloud capacity too. The Exalogic Elastic Cloud is efficient to mount an application on a secure private cloud with extreme performance and simple management. All types of applications, ranging from small scale to large scale like mainframe applications can be based on Exalogic. The cloud capacity associated with Exalogic contributes to the enhanced application capacity and performance, reduced latency, and intensive database communication. Oracle encourages its partners to take up Exalogic EX-CITE program. The program aims to demonstrate the efficiency and effectiveness of Exalogic on customers/partners business prospects. After database and application engineered systems, Exalytics is the engineered system which focuses on the Business Intelligence applications. The Exalytics machine enables speedy analysis of data using In Memory (In Memory Parallel Analytics) processing engine. The Exalytics architecture includes BI foundation suite (OBIEE), In Memory Parallel Essbase, and In Memory Parallel TimesTen database for Exalytics along with network components (Infiniband). Oracle TimesTen database is a relational In Memory database where the tables are cached under cache groups in the memory. Its existing capabilities have been enhanced for analytic processing by supporting columnar compression. Oracle EssBase is an OLAP server for analytic applications. BI query reporting time improves by 18x times when Exalytics works with Oracle database. Combination of Exalytics and Exadata improves the BI query reporting time by 23 times. The Oracle Exalytics machine is fed with four Intel Xeon E7-4800 processors where each one can provide 10 cores for computational purposes. The Oracle Database Appliance is the engineered system which serves the lower capacity database services for OLTP and data warehousing applications. It is a shorter format (quarter rack) of Exadata machine which are expandable and promise higher capacity systems. In contrary to Exadata, ODA is affordable and offers easy implementations over skilled and risk deployment. Oracle Database Appliance comes as a 4 rack unit (2 server nodes and 12TB storage capacity) running on Oracle Linux with 11gR2 RAC supported database. A complete ODA system is engineered with Oracle Linux, Oracle 11gR2 database (enterprise edition), RAC, grid infrastructure, enterprise manager, oracle automatic service requests and appliance manager. The automatic service request is an intelligent facility which can record and generate any hardware failure or replace requests. The appliance manager is a self efficient tool gets started in the deployment stage for assembling, installation and configuration tasks. In the later stages of maintenance and support, appliance manager is efficient to apply patches or reports a fixation for troubleshoot (if any). It is best suited for non expandable systems and lower capacity customers. ODA is easy to implement, affordable and ensures high performance and serviceability. Oracle Big Data Appliance is the engineered system from Oracle to handle the growth of large scale enterprise data in the varied sections of the industry. The term Big Data refers to the techniques to counter the large enterprise data, both structured or unstructured, which grows at exponential rate like web data from twitter, linkedin, mapping sites etc. In a single rack, the Big Data appliance has 216 CPU processing cores and 648TB of raw storage. Starting with a single rack, the appliance can be scaled upto eight racks. The Big Data appliance runs on Oracle Linux and Oracle JVM. Apache Hadoop from Cloudera is used for the distribution while NoSQL database (Oracle Berkeley DB) stores the data sets in key-value pairs. Using Map Reduce framework, the available data is organized and loaded into Oracle Exadata database machine. Key components which operate in this stage are Oracle loader and Oracle Data Integrator. Once the organized data is loaded, it is ready for analytical process and business decision making. The analysis is done in Oracle Exalytics In Memory machine. The statistical environment R is also used for advanced analytics at the decision stage. All the major hardware components i.e. Big Data appliance, Exadata and Exalytics share the InfiniBand connectivity so as to boost the network speed. In addition, the Big Data connectors do the load balancing between Big Data Appliance and Oracle Exadata machine. The large data is diversified, organized and then analyzed. The Big Data platform operates in three stages namely, Acquire, Organize and Analyze. The infrastructure required for the Big Data platform can be divided as per the three stages. Acquire: The stage where all available data is pulled and kept. Important components in this stage are Hadoop Distributed File System, and NoSQL Database. Hadoop is an open source framework developed by Doug Cutting from Cloudera to counter large number of upcoming data requests. It is a file system which parallel takes the requests in large batches, breaks them into smaller requests and feeds into the distributed file systems. Cloudera manager tool is used to manage Hadoop. Organize: Mapping, reducing and organization of data. Components at this stage are Oracle Exadata database machine, Oracle loader, Oracle Data Integrator, and Hadoop Map Reduce framework. Analyze: Analysis and decision making stage. Oracle Exalytics does the job in the stage. The SPARC super cluster is the engineered system from Oracle to fit general purpose requirements of customers. It runs for all sorts of workloads. It integrates the high performance components like SPARC T4 compute tool, Exadata storage cells, Exalogic Elastic Cloud, ZFS storage appliance, Solaris 11, and enterprise manager. The components share InfiniBands connectivity.